In the weeks leading up to my holiday, I really made a conscious effort to use up the little bits of products that I had left, particularly hair products. These are my current empties and I cannot wait to chuck the empty packages out! This hair mask has seriously saved my hair this summer. I cannot rave about it enough, I’ve already bought another which screams volumes in my book, especially as I’m always testing out different products. I’ve written a full review here. 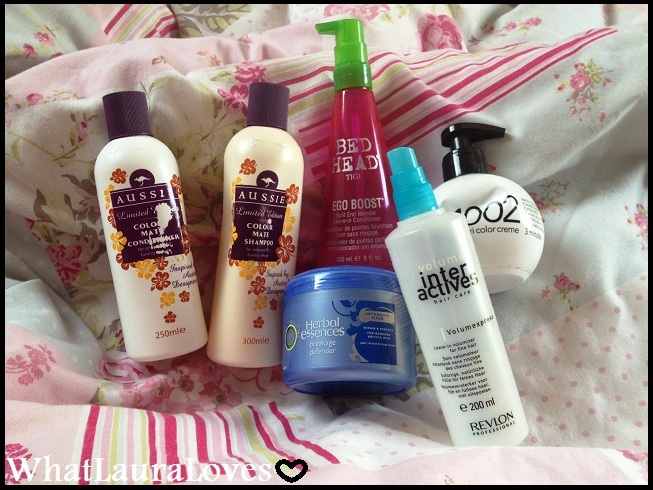 I’m a big fan of Aussie hair products, they’re fantastic quality particularly for the price. I’ve enjoyed using this shampoo and conditioner, it’s kept my hair clean and nourished and I love the peach scent that they both have. I haven’t noticed any prolonged life of my high and low lights though but I didn’t really expect that from the shampoo and conditioner, it’s more about keeping your hair clean so that your colour shines through. I’m pleased I tried these although I probably wouldn’t repurchase them unless my favourite Aussie shampoo and conditioner, Aussome Volume, weren’t on the shelf. Ego Boost is a split end mender and leave in conditioner. It’s one of those products that I can take or leave. It doesn’t work miracles, it doesn’t float my boat and in all honesty, I very much doubt I’d ever repurchase it as there’s much better products out there. For split ends, I recommend a good hair cut and as a leave in conditioner, I much prefer the Wen Cucumber Aloe Cleansing Conditioner which leaves my hair soft, manageable and not greasy in the slightest. If you’ve got blonde hair and you’re wanting a conditioner with a toner in it to give you more of an ash blonde look then I’d highly recommend these colour balls. I got mine from the salon supply shop when I had more ash blonde toned hair but I’m sure they’re available to buy in salons and online. It’s a purple toned conditioner that you pop on your hair after shampooing for a few minutes and then wash out. It works a bit like the silver shampoo you can buy and does a great job at lightening your hair and giving it a light ash tone. It’s great for brightening up dull, dark, yellow blonde hair. This isn’t a product I would repurchase at the moment as I’ve had some dark blonde/light blonde low lights put through my hair these last few months but if I go back to having more ash blonde hair then I’d definitely buy this. This is another product I’ve purchased from the salon supply shop. Volume Express from Revlon Colour Professional is a leave in volumiser for fine hair. It contains arginin, wheat proteins, ginseng and cationic bio-polymers to strengthen the hair and give it more natural body and volume and it really does work. I spritz this through my hair after I’ve towel dried it, then I blow dry it with a round brush and it creates a salon looking blow dry with lots of volume every time. This stuff is brilliant and I’ll definitely be repurchasing!